madonna-tv.com: 2012: Power Cut in Córdoba! 2012: Power Cut in Córdoba! 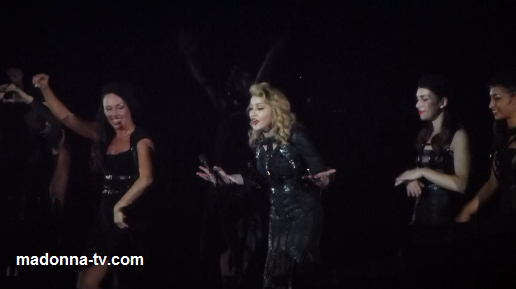 The final show of Madonna's Number One MDNA Tour certainly proved eventful in the Argentinian city of Córdoba last night (Saturday December 22nd 2012). During "Open Your Heart" at approximately 0:15am a power failure plunged the giant stadium into darkness. All sound stopped immediately - the stage lighting went off and all video screens went black. Only emergency lighting illuminating the stage remained. For the next hour confusion reigned! Madonna tried to communicate with the audience for almost 10 minutes - addressing both the Golden Triangle and then the Golden Circle area using a hand-held loudspeaker. She then left the stage while the dancers and Kakalan Trio entertained everyone as best they could. At this point it was not clear if the show would restart at all. Finally the power resumed and announcements were made that the show would restart and at approximately 1:15am that happened with the full performance of "Vogue". A very emotional Madonna apologised and thanked the crowd for their patience and understanding just before a stunning performance of "Like a Virgin", during which she jokingly smoked a cigarette on stage (a reference to the cigarette controversy in Chile earlier in the week). Madonna-TV would like to thank everyone associated with the MDNA tour for making this one of the most amazing Madonna tours ever.